This is our third generation ionic ashtray with proven NASA technology. Use it anywhere quality of air is important to you, to loved ones, friends, or peers. Although has been copied in many ways, it has never been duplicated. Or use this innovative product as a negative ion generator or an air cleaner. It produces over one million negative ions per square centimeter. These healthful negative ions are generated into the air and help freshen the air and the environment. The most advanced Ionic Smokeless Ashtray yet developed to eliminate smoke and odor. 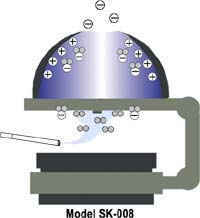 Smoke is broken down into minute, negatively charged particles which are then captured by the positively charged stainless steel lining of dome. No filters are needed. Clean air emerges from top of dome. Remove the threat or effects of secondhand smoke. Use the provided attractive ceramic ashtray or use your own favorite ashtray. Model SK008. No fans to break down, no messy and expensive filters to replace, and no opening or closing the lid. Leave it on 24/7 for a healthier environment. 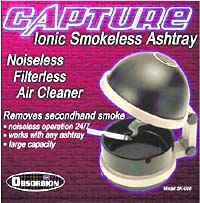 This Capture smokeless ashtray is the top of the line as smokeless ashtrays go. There are cheaper and copied models but none can match the original in performance and quality. Ours is designed with a removable dome that is lined with stainless steel to provide years of service. It comes with a ceramic ashtray that can be used on its own as well, and an AC wall adaptor. Model SK008+. Although has been copied in many ways, it has never been duplicated. Attractive 4.5" ceramic ashtray specifically designed with rubber feet so it will not slide. Black only.